318 pages | 72 B/W Illus. The displacement of Chou Wen-chung from his native China in 1948 forced him into Western-European culture. 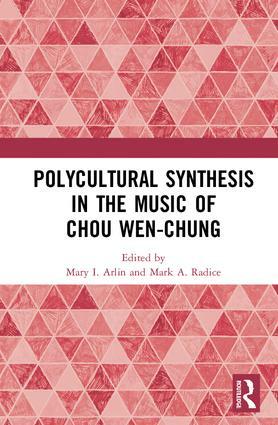 Ultimately finding his vocation as a composer, he familiarized himself with classical and contemporary techniques but interpreted these through his traditionally oriented Chinese cultural perspective. The result has been the composition of a unique body of repertoire that synthesizes the most progressive Western compositional idioms with an astonishingly traditional heritage of Asian approaches, not only from music, but also from calligraphy, landscape painting, poetry, and more. Chou’s importance rests not only in his compositions, but also in his widespread influence through his extensive teaching career at Columbia University, where his many students included Bright Sheng, Zhou Long, Tan Dun, Chen Yi, Joan Tower, and many more. During his tenure at Columbia, he also founded the U.S.-China Arts Exchange, which continues to this day to be a vital stimulus for multicultural interaction. The volume will include an inventory of the Chou collection in the Paul Sacher Stiftung in Basel, Switzerland. Mary I. Arlin, a music theorist and performer, is Professor Emerita of Music Theory at Ithaca College. She has published articles on the history of music theory and transcribed and edited Giacomo Zucchi’s Three Serenades, op. 3 for viola and piano (New York: International Music, 1988). Mark A. Radice, a musicologist, composer, and performer, is professor at Ithaca College. His most recent books are: Karel Husa: A Composer’s Life in Essays and Documents (2002), Concert Music of the Twentieth Century: Its Personalities, Institutions, and Techniques (2003), and Chamber Music: An Essential History (2012).